Well, it took us five years to get around to attending the Heritage Harvest Festival at Monticello but I’m happy we made it there yesterday. We didn’t know quite what to expect, but it was something like a cross between a county fair and farmer’s market or craft festival. Central Virginia is rich in local farms and businesses producing high quality food and other agricultural products, and the Heritage Harvest Festival attracted a good many of them to exhibit their wares. Some of the vendors/exhibitors were already well-known to us, so we concentrated on some we had not done business with before. But first we stopped at the Tasting Tent set up by Southern Exposure Seed Exchange, the driving force behind the festival. Can you believe that I’m actually a little tired of fresh tomatoes just now? It’s true – the garden has been good to us this year – but I saw some on display that I wanted to sample. ‘Long Tom‘ is now on my list for next year. 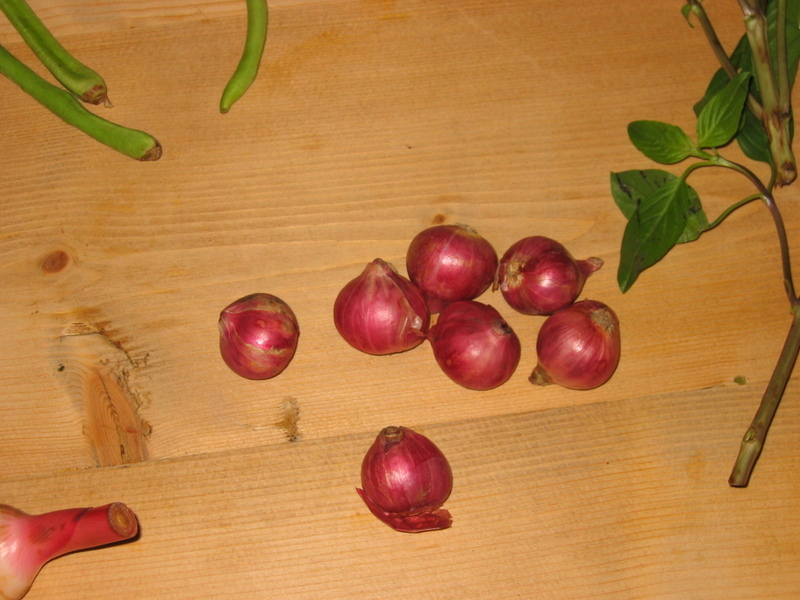 And due to a lot of pickle-making this summer my garlic harvest is already dwindling, so I bought some ‘French Red’ to supplement what I grew. Huge cloves on this one. I’m not sure if it’s the same as the one listed as ‘Mild French’ on their website, but it looked interesting. The spouse and I went our separate ways for lunch. I had a bratwurst from The Rock Barn, a caterer and farmer’s market vendor, and the spouse had a pizza from Primo Tuscan Wood Oven Pizza. We would happily eat either one again. Hard cider seems to the trendy new thing. Albemarle Cider Works is the local veteran, having produced several vintages now (if that’s the right word when talking about cider), but we noticed a booth from a newcomer so stepped up for a tasting at Castle Hill Cider. We liked what we tasted, and especially enjoyed the stories behind the names of their ciders. Although we didn’t buy any bottles, we plan to visit their beautiful tasting room sometime and buy then. Then we headed over to the Edible Landscaping booth for a talk by owner Michael McConkey about growing figs. You know, I hadn’t really considered growing figs before, but now I’m totally sold on the idea. He made it sound fun, but the bullet points were that the hardiest varieties (i.e. best chance of success locally) are ‘Chicago Hardy’ and ‘Celeste’, and they’d probably be happier if we sweetened up our acid soil for them with some lime. Although the Heritage Harvest Festival would be worth attending at any location, it was not in just any location. We’ve toured Monticello a couple of times, but never during the growing season. So on our previous visits, at the end of the house tour, we’d just walk through the bare gardens and imagine what they’d be like in summer. Now we don’t have to imagine. I wish I had taken a picture of the lantanas trained as standards. One of them had a trunk about 2 or more inches in diameter. I’d love to start one, but don’t have a good place to keep it in the winter. Someday, when I get my greenhouse………but then again, how long would it take to grow one that big? But anyhow, one of the neat things about touring gardens is discovering new plants. 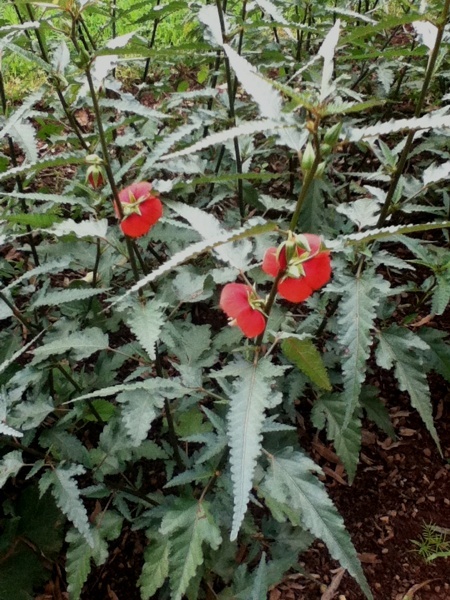 How many of you reading this know this plant? The vegetable garden at Monticello was mostly green in an end-of-the-season kind of way, but a few spots had been recently replanted to fall crops. The mature pumpkins and winter squashes in the garden emphasized the harvest theme. I wonder if the Monticello gardeners resort to 21st century methods to keep the squash vine borers away, or do they know some 18th century secret? All in all, a very pleasant and informative experience, but as I was writing this I thought of an improvement I’d really like to see. 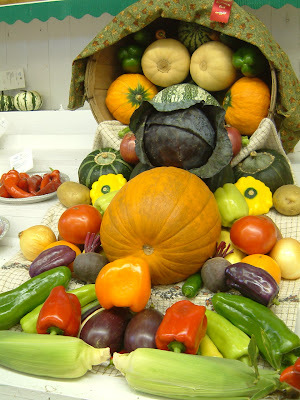 Where I’m from in the Midwest, county fairs have extensive horticulture competitions where the gardening public raises and enters their best tomatoes, dahlias and just about anything else you can think of. I’ve written before about the Sandwich Fair in my home county, but if you missed those posts, here’s one photo from 2009. Sandwich is the name of the town, by the way. There’s no sandwich competition that I’m aware of, but hey, maybe they should have one. To my knowledge there are no agricultural exhibits from members of the gardening public on this scale anywhere in Virginia. The county fairs have a very few poor exhibits, most from 4-H kids. Maybe the state fair (which I haven’t been to) has something good, but not any of the county fairs I’ve attended here. I’d love to see something like that added to the Heritage Harvest Festival. It wouldn’t even have to be a competition, just a tent or two where gardeners could show off their harvests. I have no idea on that flower ID, but I WANT to know… because it’s beautiful! Don’t get excited to go to the VA State Fair for ag displays … the animals are okay but the gardening leaves a lot to be desired. If you want to see something a little more impressive, drop down to Raleigh for the NC State Fair. Thanks for the info. As it turns out, we won’t have time to make it to the VA State Fair this year, so now I don’t feel too bad about it. Maybe I can talk the spouse into driving down to Raleigh in October. I am from the UK and I am trying to obtain a small number of potato onions to grow in the UK. I have researched the subject of this type of onion I might be able to tell you why they are called potato onions. Although grown in many Countries the reason for them having this name comes from the UK. Because the UK has some very wet Autumn and winters the potato onion was hilled up in rows similar to the way you would grow potatoes. This was done so that rain would run off the hills easily so that the onions would not get to wet and thus rot. shallots are still grown in this way in certain parts of the UK. if you Google “Kenneth Klotz potato onions” There is an interesting article about a guy in Charlottesville VA who set up Kalmia farms to try to save this onion from extinction in the 1980s. Sadly this farm is no longer and the red potato onion may well be extinct. If you have a small number of these onions to spare I will cover postage and whatever you would consider a reasonable price for them. Sadly they seem to no longer exist in this Country and if you are able to find Kalmia farm you might be able to find the red potato onion which I am also trying to trace. Thanks for the info, John. That’s the most convincing explanation for the term “potato onion” I’ve heard. I think Kalmia Farm is out of business, but some of their stock may have found its way to Southern Exposure Seed Exchange, from where I got my potato onions. I suspect these types of onions fell out of favor because they’re smaller than the big seed-grown onions we’re now accustomed to, but I think they generally have better flavor than the seed-grown onions. I’m not sure what regulations there are for international shipments of plant material, but I’ll see what I can do. I do believe there are restrictions on sending out plant material from your Country but it seems to differ form state to state as I have ordered a couple of varieties of heritage onions one of which is now planted in my garden. and another on its way to me. I have been putting together a small collection of onion varieties and have nine multiplier varieties obtained from Garden Organic in England. Two varieties of everlasting onions one of which is the so called welsh onion that do not form bulbs. I have three varieties of the Egyptian or walking onions and the ones which have or are being shipped from the US. Now I will give you the reason why this has developed into a collection. Many years ago my mother grew an everlasting onion variety and after she had died after a long illness I thought as she was such an avid gardener I would try to maintain her onions in a way to remember her by. Unfortunately her garden had long overgrown and they had died out. Six months ago or so I decided to try to find these by use of the internet. By entering various versions of onions I have ended up where I am now with a collection of heritage onions nearly all of which are quite rare. One which is on its way to me is called I’itoi purple onion form Tucson AZ which is a multiplier onion that may pre-date the development of the shallot. This may have been given to the native american people by Jesuit priests in the 1700 th Century and the last remaining clump cultivated by just one person before it was saved. I believe that this onion is used to the dry conditions where it is grown so to maintain it I intend to hill this up when I plant it to ensure its survival in my garden Using the the method I described to you. I will however make sure that I have small trench below soil level so run off water will not ruin these bulbs. This onion will take pride of place amongst my collection but it will be difficult to grow as it is intolerant of wet conditions. I have found it very difficult to ascertain what is the true potato onion will the I’itoi onion now become a potato onion for me as it is not where it is currently grown as the conditions there mean it does not need any special treatment. I assume that it probably originated from Spain as they had an influence in that area of the US I think. My reason for purchasing bulbs from America is that my Multiplier onions may in fact be old shallot varieties and without having material to compare I will never know. Maybe the west was not won by the colt 45 but by sustainable crops that allowed the early settlers to survive in those early days. There is a wealth of history behind the different peoples and different crops that made your country what it is today. How sad it is that with modern farming methods and modern crops many of these old varieties are no longer in existence. “There is a book that needs writing by someone to trace those origins for posterity” and save these as a vital part of the heritage of America. Now you’ve got me going on this topic, John. I don’t have a lot of experience growing these onions but I appreciate the history behind them, so I looked up the I’itoi onion. I knew of Gary Paul Nabhan, but wasn’t aware that he was the one who rescued the I’itoi onion (well actually I wasn’t even aware of the I’itoi onion/shallot). I’ve been wondering if the Asian red shallot commonly used in Thai cooking is similar to the red potato onion you’re seeking. Although it’s usually called a shallot, it seems to have the same round shape as a large unsplit potato onion. I may try to plant some from the Asian supermarket and see what I get. For what it’s worth, I was browsing the Seed Savers Exchange forums this evening and found a thread about red potato onions that pointed me to eBay where I discovered a listing from a seller in England offering red potato onions. Thank you for the info on the seller in England offering potato onions but I am sure that what he is offering are similar to my multipliers and are in fact shallots. I would not want to spend that much money buying five bulbs as potato onions when I could buy a hundred and twenty shallots for the same price. I have found the whole subject very confusing but from your photo of your potato onions. I think they may be the true potato onions. There is so little information on a definitive description that anybody can call a shallot an onion and then charge very high amounts saying they are a rarity. Some sellers say they are bigger than a shallot, some say smaller. The only description I have come across that says there is a difference between potato onions and Shallots was from “Bega Alliums” and their description fits your onions. Sorry if I have started you off on this subject but I have found the whole thing very intriguing and have at times thought there was no such thing as a potato onion. Incidentally the I’itoi onion from some of the photos I have seen appears to set seed and as multiplier onions and shallots are said to be sterile could be useful in breeding new varieties. Good luck with growing the red Asian shallots and I might try to seek out these myself next time I go to London where there are many of these shops selling oriental herbs Etc. It looks to me like your going to end up with a collection of multiplier onions as well. I must start planting other vegetables or all I will have to eat are going to be onions and I am not going to start researching them. Thanks again for pointing me to some interesting information – I just checked out Bega: Alliums webpage describing the difference between potato onions and shallots. Next spring I’m going to examine the way they sprout to see if I can spot the difference. I sent you an email with the subject line “Potato Onions”, but since then I have good news and bad news. I’ve been looking at my cache of potato onions, which has been in storage in our garage all summer and fall. We ate a few when I harvested them, a few more started to go soft and were discarded, and now I’m down to exactly 13 bulbs of various sizes. So….I’m still willing to share, but the quantity will be small. That’s the bad news. The good news is that I’ve decided to order a few more types from sellers here in the US and see what I get. Maybe next fall I’ll have more to share. More good news, maybe, is that although my onioins were described as “yellow” by the seller (Southern Exposure Seed Exchange), they’re really more of a pale purple with amber skins. Almost red? I have replied to your Email regarding subject line potato onions I have tried to find more info on the subject but there is very little available.